When it comes to the Bible, anyone who reads it, goes to church, or studies scripture knows that everything in the Bible is related to certain locations. Events are described in detail throughout the Bible, and locations, rivers, mountains, hilltops, etc… are all relevant to each and every story. So it makes sense that someone decided to merge the Bible with Google Maps – and I mean, this mashup is quite impressive! 1) Chose your desired scripture from the drop down menus. 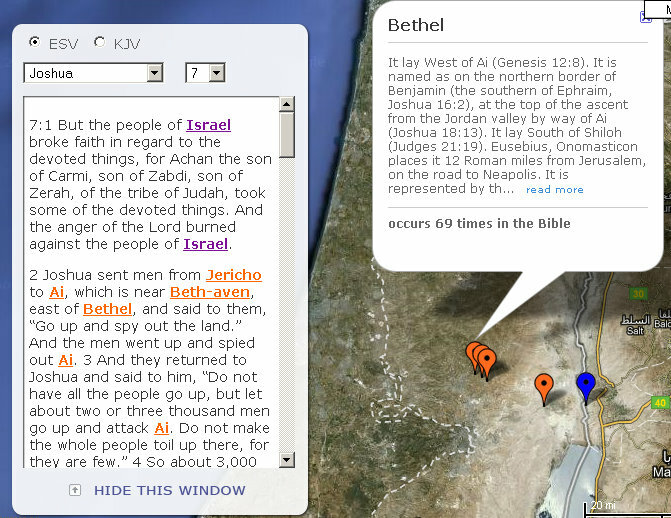 2) If the Google Map has relevant locations to that piece of scripture, then map icons will appear throughout the map. 3) Click on the map icons to read more that specific location, the history, geography, and associated Biblical references. Some scripture is left out of the map because locations cannot be pinned down. Take for example The Book of Job. The exact locations are not known (at least not that I know of), so you can’t really display relevant Google Map icons. Let me know what you think below in the comments!